Harry Edison (tp) Bob Brookmeyer (vtb) Zoot Sims (ts) Al Cohn (ts, bars) Hank Jones (p) Freddie Green (g) Eddie Jones (b) Charlie Persip (d) recorded NYC, December 27, 1958, – between Christmas and New Year. We are on a Fifties roll here. Standards, strictly happy music, nothing dark or introspective (you can put the beret away – for now). Zoot Sims, Al Cohn, Hank Jones, Bob Brookmeyer, every one takes a turn. I don’t pretend to understand the difference between a valve and a slide trombone, but I like it. 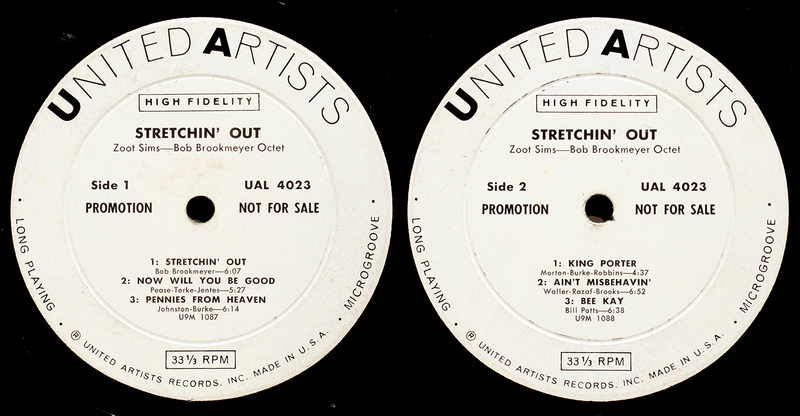 Vinyl: UAL 4023 Promo white label, US original. VG, slightly noisy pressing typical of United Artists late Fifties/ early Sixties – a low level of crackle to which cleaning several times yields no improvement, probably included some recycled vinyl. In addition, there are enough handling scuffs to complete that period vintage click’n’pop sound that movies add to soundtracks to make them sound “authentic” – different time, different place, different attitude. Having to choose between a photo of Zoot Sims with his cheeks puffed out, and a little cheescake in a gold lame bathing suit, must have been a tough call. “Hey sweetheart, what are you doing after the shoot?” The full Mae West schtick. “Come on up, I’ll have nothing on but the radio. Is there anything I can get you – like excited? I’d like to see Paris before I die. Philadelphia will do” Girly cover, perfect for the Fifties bachelor demographic.Now where’s my pipe? Messy factory numbering process, big corporation cutting corners with product quality. Source: South London suburban record shop. 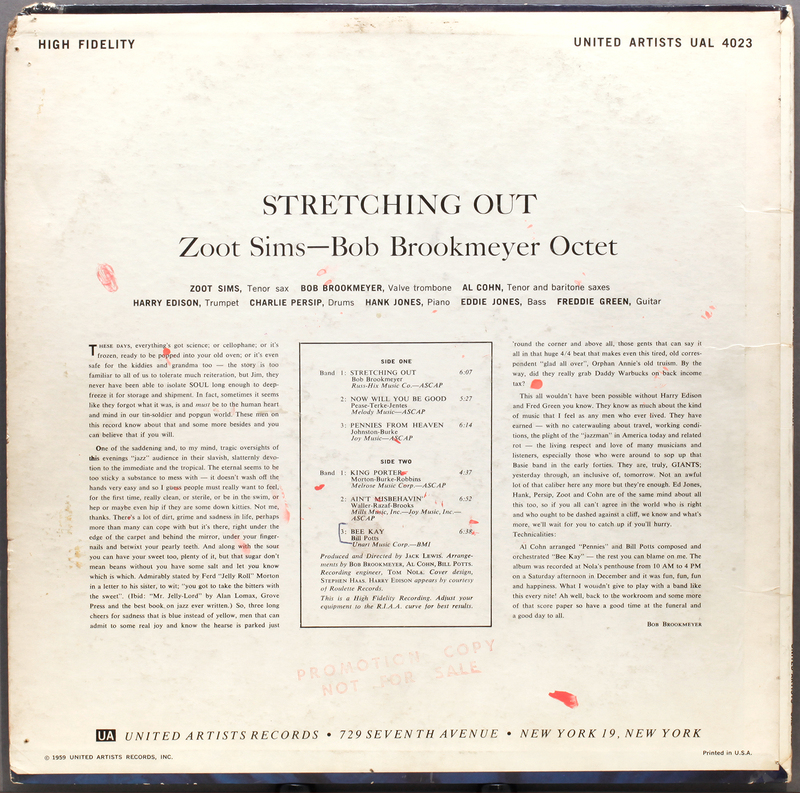 This entry was posted in United Artists, Zoot Sims and tagged Al Cohn, Bob Brookmeyer, Charlie Persip, Eddie Jones, Freddie Green, Hank Jones, Harry Edison, United Artists, Zoot Sims by LondonJazzCollector. Bookmark the permalink. My then twenties-something ex-step-son didn’t own a commercially produced record. It was all free downloads or nothing! What people get for free is worth every penny. When nothing is worth producing, nothing will be produced. Ahh! the lure of the Evil Silver Disk, bonus tracks. Get behind me temptation. It all sounds very nice,bonus tracks, but it is a slippery slope. Before you know it, you will be on downloads, no physical media at all. Where will all us collectors be then?